Posole is the name for hominy in Mexico. Posole Rojo is a soup made from hominy, pork shoulder and a mix of reconstituted dried red chilies. It is an earthy mix of absolute scumptiousness, my new favorite soup. 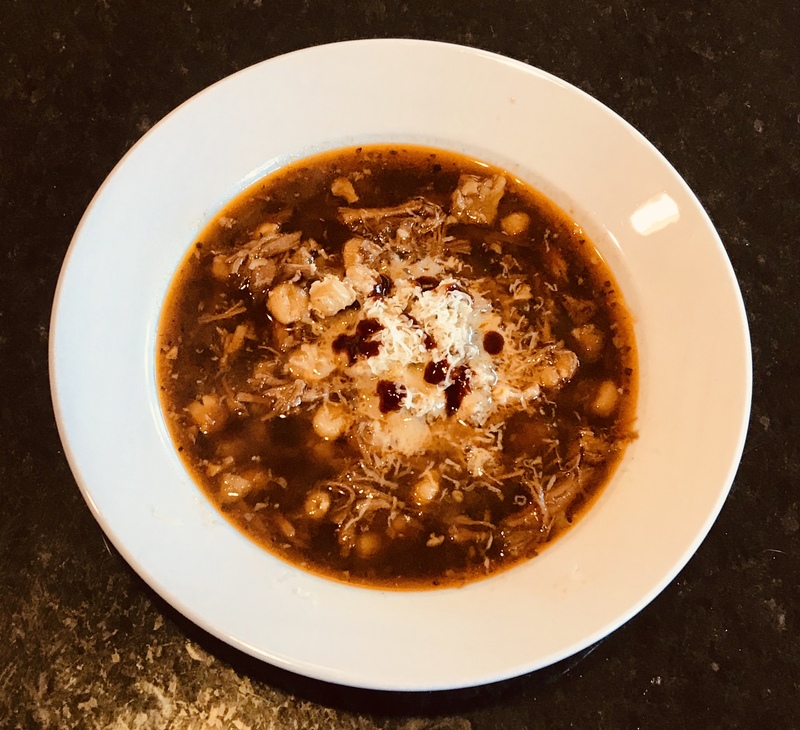 I was inspired to make it by a Posole Rojo recently added to the menu at the Cantina Los Charros side of the Essex Restaurant in Centerbrook, CT. 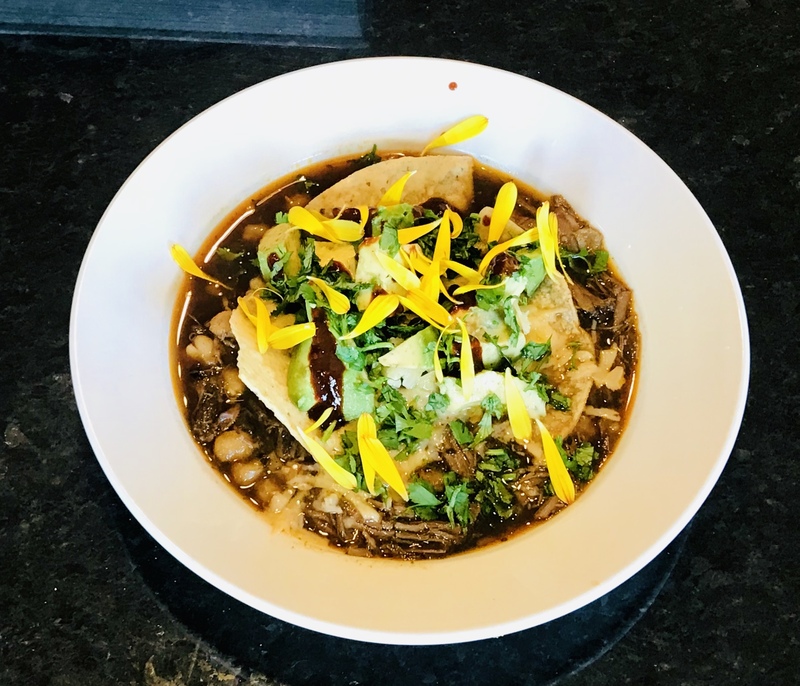 The Essex has two kitchens and two sides, one a fancy farm-to-table tour de force with a menu that changes monthly, and the other a very casual and friendly place, with a long bar, an open kitchen and the best Mexican food in CT. It's my Cheers. 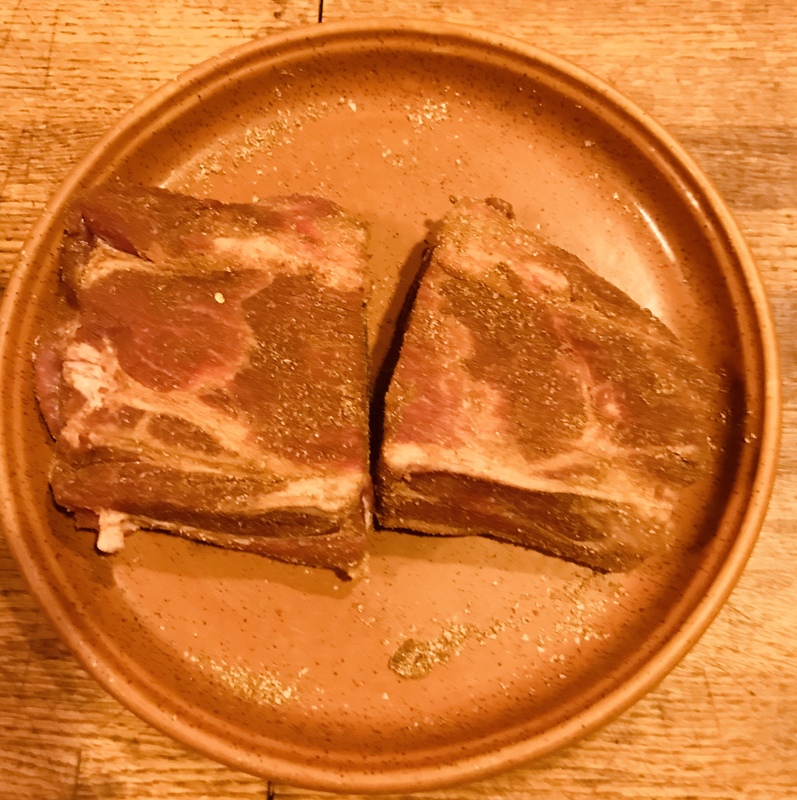 From left to right: 2 lbs of boneless pork shoulder, 45 oz of hominy, 2 qts of chicken stock, 2 bay leaves, 6 cloves garlic, 3/4 cup Arbol chilies, 5 Ancho chilies, 1 onion, 2 tsp ground cumin, 1 T dried oregano, Kosher salt and 2 T vegetable oil. You then put the chilies, the steeping liquid and the peeled, sliced garlic cloves into a food processor or a blender and spritz into a smooth purée. You then push this through a fine meshed sieve, discarding the solids. 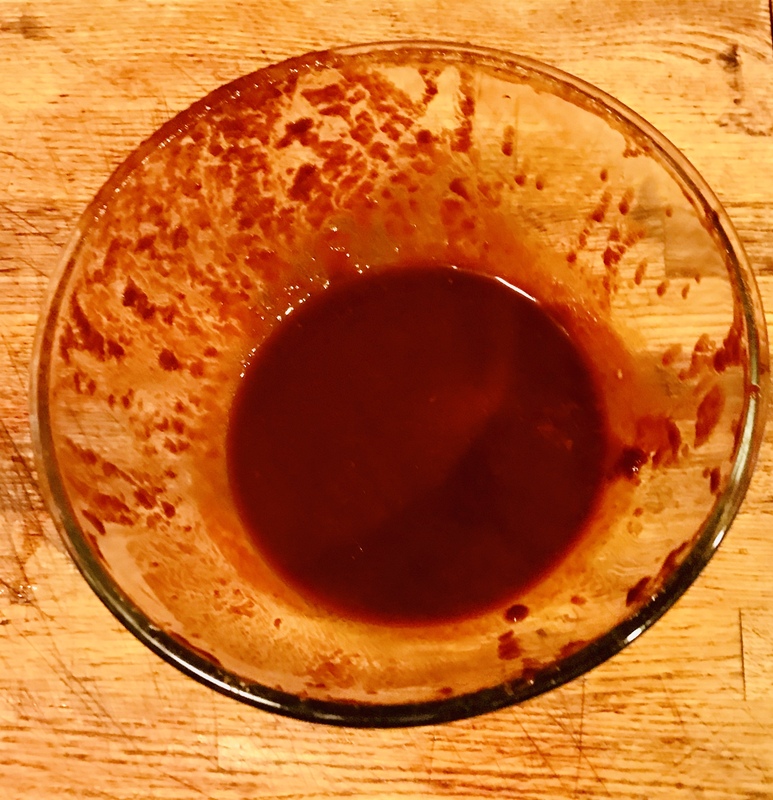 Above is what I had left of the strained chili sauce after I added 3/4 cup of it to the soup. 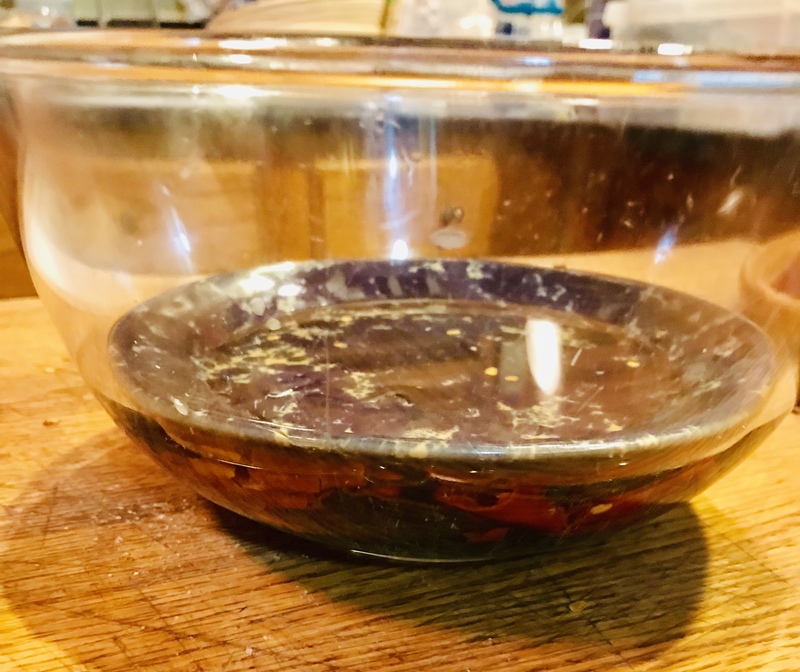 I used some of it to drizzle on top of the finished soup. 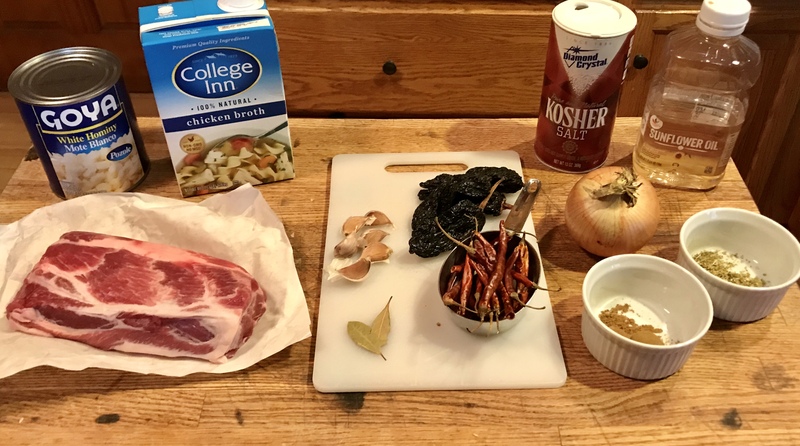 I first started reconstituting dried chilies when I made the Food Lab's Best Short Rib Chili (see Chili Over Savory Jalapeno Cornbread). The Food Lab recipe just uses the chilies without the steeping liquid so you end up with a paste rather than a sauce. But whether paste or sauce, I have never looked back. I even threw out what was left of my bottle of chili powder. 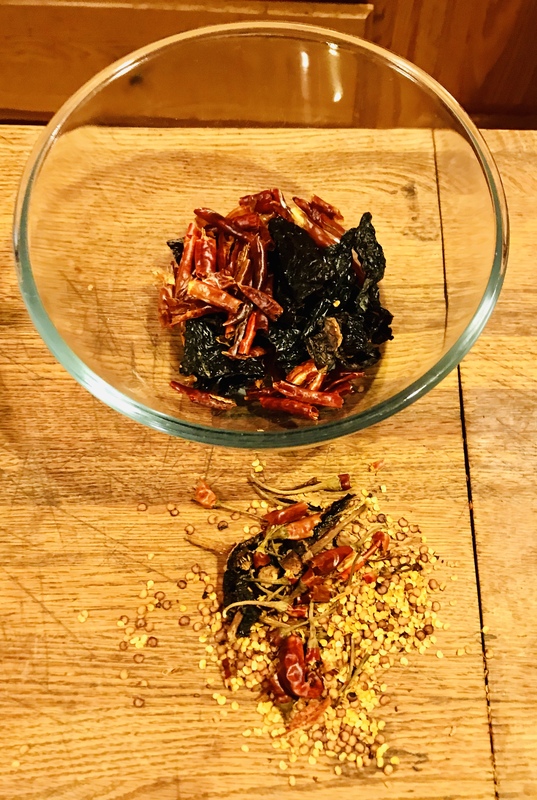 The reconstituted dried chilies have an amazing depth of flavor that you just can't get from chili powder. 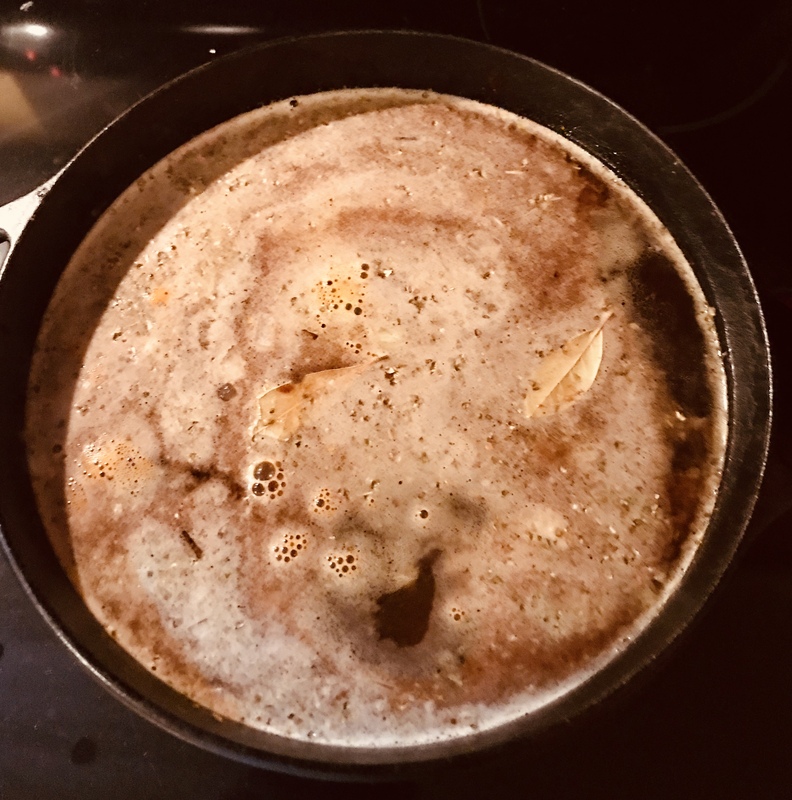 Once you have softened the onion and browned the pork, you add the chicken stock, oregano, bay leaf and 1/2 cup to 3/4 cup of the chili sauce, to taste. The Food Network recipe calls for 2 cups of water as well, but I would leave that out next time to get a thicker soup. You can always add some water or broth later if necessary. Bring to a low boil, then reduce heat to maintain a low simmer. Partially cover and cook, turning the pork a few times, until tender, about 3 hours. Cantina Los Charros flash fried the hominy before adding it to the soup. This gives it a crisp texture that I liked. I tried to do that, but couldn't get it crispy the way they did. Will keep experimenting.